My Students’ Blog Goes to Final!!! I heard the exciting and surprising news on Thursday morning. 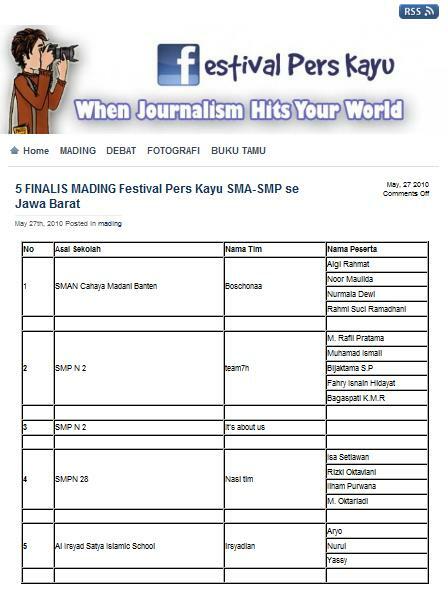 My students’ blogs goes to final on an event held by Karisma ITB, called Festival Gedung Kayu. They are Aryo, Yassy and Nurul, my students in Secondary 3. It will be their last contribution to defend their school, Al Irsyad Satya Secondary. After this, they will continue their education to high school, right? 😉 Ms. Nova and I took part on being busy, helping them manage the blog. We gave suggestions and ideas, but they do their best to manage the blog. They choose the template, write postings and so on. It’s not a difficult job, I guess. This year they got blogging as one of the subject on my lesson, Art & Culture. They also got some additional knowledge from ms. Nova on ICT session. The final round will take place this Saturday (May 29, 2010). Nurul, Yassy and I have briefed all-out (I did not get to meet Aryo). They will have to decide the suitable theme, develop the idea and do all the workmanship of their total work. Bismillah. Good luck, kids. This is counted as an achievement already. To be the only Islamic private schools competing in the finals, I’m proud of you. Please be focus on the process, do your best, and leave the results to God alone. Our prayers with you. Go, Irsyadian! This entry was posted in Achievement, student's works and tagged Achievement, AIS, blog, competition, my students, school, Secondary. Bookmark the permalink. 1 Response to My Students’ Blog Goes to Final!! !